Welcome to our hotel in the heart of the Gator Nation. 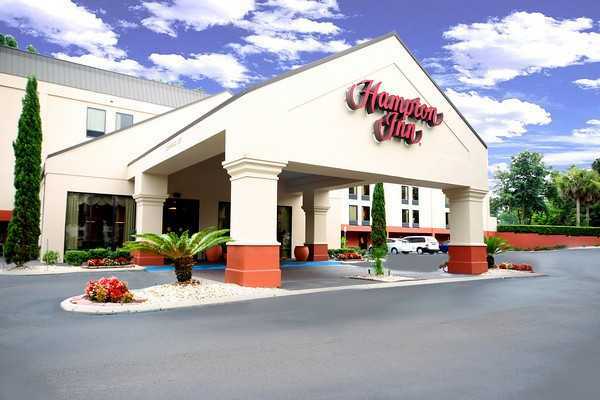 The Hampton Inn hotel in Gainesville, FL is conveniently located off I-75 at Archer Road. Enjoy Southern hospitality at its finest. Our friendly team is here to make your stay memorable with that touch of Gator fun. Stay here and experience the recently completed renovation of our Gainesville, FL hotel. We have an inviting lobby, fitness center with state-of-the-art equipment, carpet, drapes, furniture and more. All guest rooms offer a refrigerator and microwave. Enjoy easy access to the University of Florida, or enjoy our natural wonders. Alachua County features several freshwater springs for scuba diving, tubing or snorkeling. Visit the Devil's Millhopper for a walk on the wild side, or stop by Lake Alice for an alligator encounter. Relax in your comfortable guest room in a clean and fresh Hampton bed at this centrally located hotel in Gainesville, FL. Whether you're here for business or for pleasure, the Hampton Inn Gainesville hotel is the smart choice for comfort, convenience and service at a great rate.